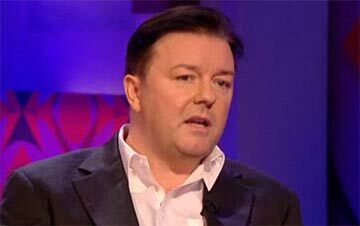 Why is Ricky Gervais dyeing his hair? Ricky Gervais appeared on Jonathan Ross last Friday continuing his usual chummy banter with the host and was actually very entertaining. The thing I noticed while we watching, though, is that he’s dyed his hair a really unfortunate shade of black. It’s that black that everyone notices, not the one that people ignore because they assume it’s your natural colour. The thing is, I don’t understand why. Ricky’s into his 40s, he’s successful because he’s funny, not for his looks. Why does he feel the need to cover up the grey? I’m 36 and just starting to notice the first grey hairs creeping in. There’s no way I’m going to bother digging out the Grecian 2000 – going grey can often end up looking sophisticated. And anyway, it’s going bald that you really have to worry about – maybe that’s what Ricky’s really trying to hide! Previous Previous post: Bloody DFS! Next Next post: Why buy mince pies in October?